In 1939, Telefunken introduced an air defense radar called the Wurzburg A. Operating at 560 MHz, with a 3 meter (9.8 ft) parabolic antenna, this radar had a range of 28 miles and enabled the tracking of aircraft height, distance, and baring. It served to guide night fighters to attacking Allied bombers and to direct anti-aircraft guns and searchlights. To improve range and accuracy, an improved version called the Wurzburg Riese (Giant Wurzburg) was designed with the sam basic electronics but using a larger 7.4 meters (24.3 ft) antenna and a more powerful transmitter, giving it a range of 44 miles. The Giant Wurzburg antenna was constructed by the Luftschiffbau Zeppelin GmbH using the same lightweight alloys and construction methods as its airships of the 1930's. Its size prevented it from being fully mobile; examples were mounted on fixed bunkers, rail cars, and in at least one instance, aboard a ship. The electronics and operators were housed in a shed on the azimuth mounting, turning with the radar. radar in use until the SCR-584 was introduced by the U.S. Army in late 1942. By the end of World War II approximately 1500 Giant Wurzburg radars had been deployed around Germany and nearby industrial areas to aid in the destruction of Allied bombers. Because it was large and well built and widely available, many Giant Wurzburg radars were taken over after the war and adopted for scientific research. A number of thee radars were brought to the U.S. for scientific studies of the Sun. They were also used as radio telescopes to map the Milky Way. 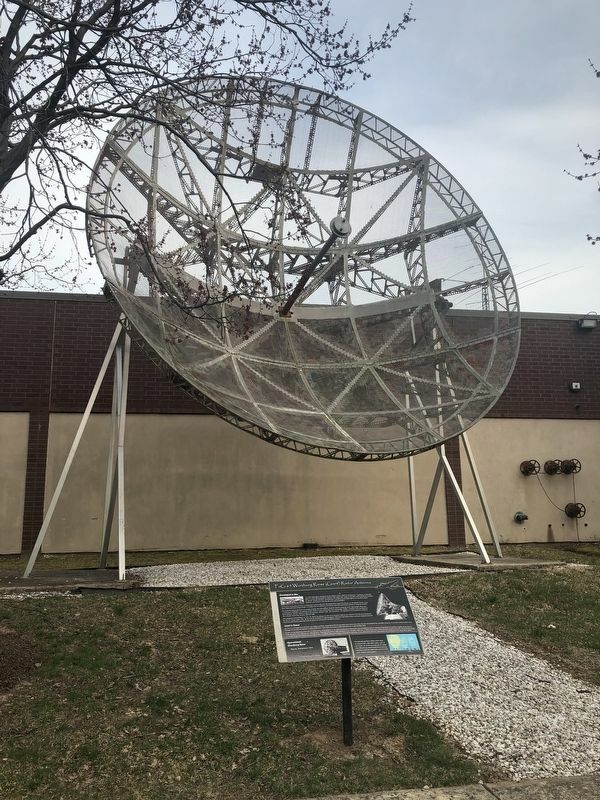 In 1947, three Wurzburg antennas including the one on display at the National Electronics Museum, were installed by the U.S. Bureau of Standards in Sterling, Virginia, to be used research solar noise and sun spot phenomena. They were moved to Table Mountain, near Boulder, Colorado, in 1952 where they continued to be used for research. The Giant Wurzburg on display is the only remaining example in the U.S.; others were destroyed or returned to Germany. It was donated by the U.S. Department of Commerce to the Museum in 2006. Two Wurzburg Riese radars were used in conjunction with other types such as the Freya, an early warning search radar. One Wurzburg would track the incoming bomber while the other was used to track and control interceptors. Location. 39° 11.725′ N, 76° 41.084′ W. Marker is in Linthicum Heights, Maryland, in Anne Arundel County. Marker is on West Nursery Road south of Elm Road, on the right when traveling north. Touch for map. Marker is at or near this postal address: 1745 West Nursery Road, Linthicum Heights MD 21090, United States of America. Touch for directions. Other nearby markers. At least 8 other markers are within 2 miles of this marker, measured as the crow flies. XAF Radar Antenna (a few steps from this marker); SCR-270 Radar Antenna (within shouting distance of this marker); AN/SPG-55B Radar (within shouting distance of this marker); TPS-43 (about 300 feet away, measured in a direct line); Nike Ajax (about 300 feet away); Stoney Run Train Station (approx. 0.8 miles away); Elkridge Furnace Inn (approx. 1.6 miles away); Linthicum Heights (approx. 1.8 miles away). Touch for a list and map of all markers in Linthicum Heights. More. 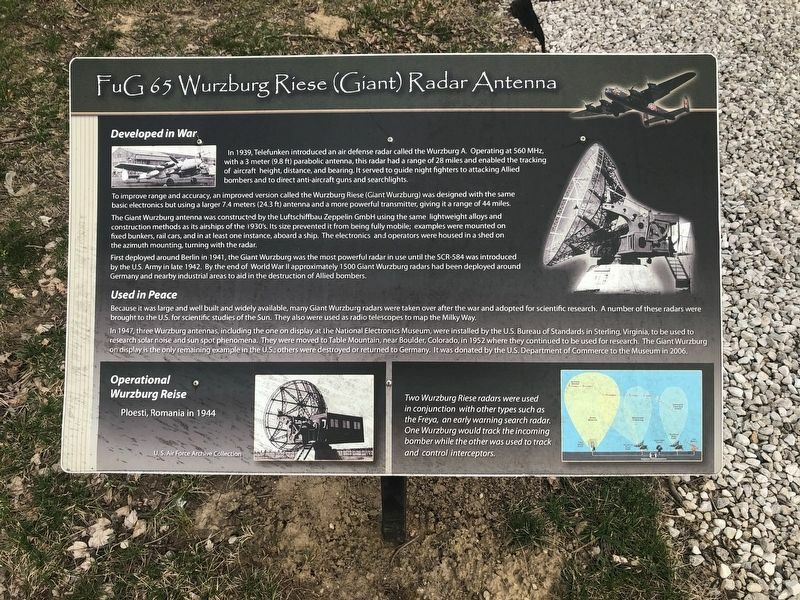 Search the internet for FuG 65 Wurzburg Riese (Giant) Radar Antenna. Credits. This page was last revised on March 31, 2019. This page originally submitted on March 31, 2019, by Devry Becker Jones of Washington, District of Columbia. This page has been viewed 59 times since then. Photos: 1, 2. submitted on March 31, 2019, by Devry Becker Jones of Washington, District of Columbia.